Here at COMC we have already started kicking things into high gear. On Thanksgiving alone, we had four times the average number of cards requested for shipment – and with the weekend coming up, we are expecting this to tick even higher. To support all of our users, Customer Service will be available by email on the 28th and 29th. Items must be purchased in Simplified Shipping Mode to qualify. All non qualifying standard shipments of 20+ cards will instead receive a $3 shipping discount. Ordering just a few cards? Get one chance to win! Buying more? Get one scratch card for every 20 cards in your order! 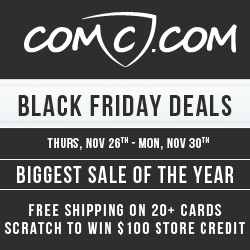 For every 100 cards purchased with store credit and mailed out in November, we will credit your COMC account with $5 on the first of December. This is your opportunity to be paid to buy big! This entry was posted in Advertisement, Black Friday, Fun, Holidays, specials. Bookmark the permalink.